In 2015 total food consumption in the Netherlands increased from EUR 56.7 billion to EUR 57.4 billion, with supermarkets accounting for more than 50% of this amount, while the market share of out-of-home food services (hotels, restaurants, catering and convenience) has further increased. It is expected that until 2025 the total value of food sales will grow to EUR 69 billion, an average increase of 2% per year. However, it is not expected that all food retailers and wholesalers will benefit from this increase. In particular, the margins of small- and mid-sized players remain under pressure and are expected to lose further market share, while a concentration process is ongoing. 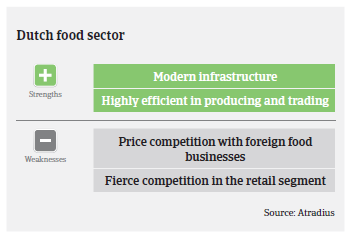 Additionally, the share of food product offers in the assortment of originally non-food retailers is increasing (e.g. Ikea or Action). At the same time consumer behaviour is changing at the expense of food retailers: during the economic crisis the market share of retailers increased due to higher price-sensitiveness, but with the rebound consumers started to spend again more for food and beverages out-of-home or for food home delivery, a service that has recorded high growth rates over the past two years. Dutch food retailers will have to react/adapt to those changing food consumption patterns. The Netherlands is one of the largest exporters of agricultural and food products in the world. Food product exports amounted to about EUR 60 billion in 2015 (90% fresh and processed food, 10% beverages and tobacco). More than a quarter of food exports consist of re-exports, i.e. foodstuffs that are imported undergo minor processing and are exported again. Due to the weaker euro exchange rate and increased demand from overseas markets, Dutch food exports increased in 2015, especially to the UK (up 5.9%), USA (up 20.4%) and Switzerland (up 27.5%). Asia accounts for more than 10% of food exports. While exports continued to increase in 2016, deliveries to the UK have been negatively affected by the Pound Sterling depreciation since the Brexit decision, and the Russian import ban still hurts the industry, particularly the fruit and vegetables subsector. Food exports to Russia decreased by more than 50% over the last two years. 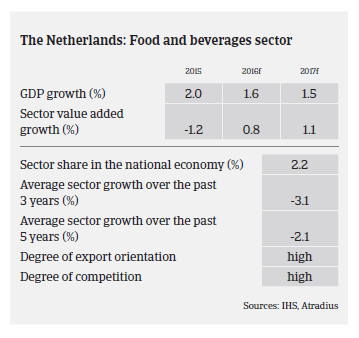 In general, demand for Dutch food products is expected to increase further in 2017, and profit margins of most businesses are expected to remain stable. 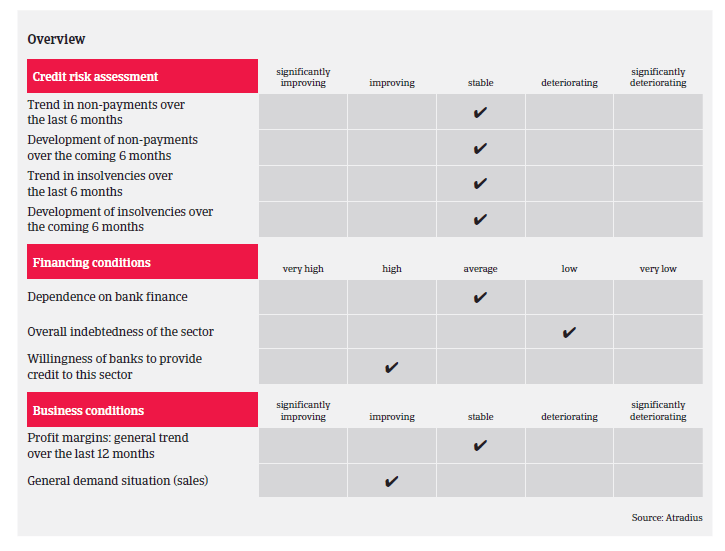 Banks are generally willing to provide loans, and businesses’ gearing is rather low. The average payment duration is 40 days, and the amount of payment delays, protracted payments and insolvencies remains low compared to other Dutch industries. In line with the overall trend in the Netherlands, food business insolvencies have decreased in 2015 and 2016, by 17% and 25% respectively. However, in 2017 this positive trend is probably coming to an end, with business failures forecast to level off. For the time being our underwriting stance for the food sector remains open, as the positive performance is expected to continue in 2017.